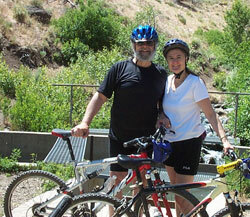 Join Sierra Adventures on this bike tour and discover some of the treasures in the Reno / Lake Tahoe area. Intro: Interested in discovering bike rides that are hidden local treasures? Ride with us and you can discover all the Reno / Tahoe area has to offer. View kayakers and rafters as they float past you on the Truckee River. Explore by bike and let us show you the beautiful places and views that only the locals know about. The Tour: Your discovery bike tour begins with a complimentary pickup, or just meet at our adventure shop. Bikes and helmets are set up and adjusted to your needs. We will provide water, power bars, and fruit en route to your destination. Your knowledgeable biking guide will lead you through winding back roads, river trails adjacent to scenic parks, and quiet neighborhoods. Our bike rides are designed to stay within your abilities and endurance level while providing a memorable experience. Suggested Clothing and Gear: Bike Clothing / Shoes & Peddles / Change of Clothes / Camera / First Aid Kit / Two Way Radio / Whistle.